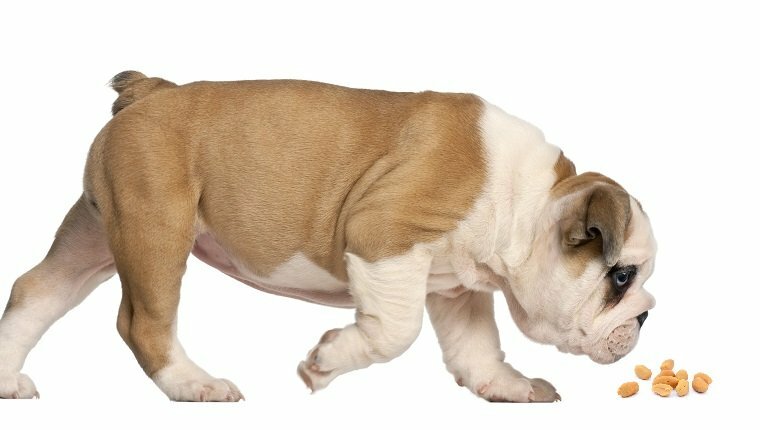 Can Dogs Eat Peanuts – What is Safe and What is Not? Dogs love peanut butter. We all know that. You’ve probably seen a video on YouTube of dogs just loving peanut butter. And if you’ve ever used a Kong toy for eating, you know it is best when you put some peanut butter to close the gap. But when it comes to eating actual peanuts, are they safe? Can dogs eat peanuts? We always assume things. Because peanut butter is made of peanuts, we assume dogs can eat peanuts as well. But when it comes to the health of your dog, things are a bit more complicated. Not all peanuts and not all peanut butters are created equal. Generally speaking, peanuts are a good source of protein, healthy fats, vitamin E, and vitamin B6. If you take that into consideration, peanuts and peanut butter are great food for your dogs. But can dogs eat peanuts? The short answer is yes, but there are a more complicated explanation and some big exceptions. There are things you need to know before feeding your dog peanuts. What types of peanuts are safe? When you think of peanuts, you probably think of those delicious and salted peanuts most people prefer. Well, bad news, those are not good for your dog. Instead, you can give your dog dry-roasted or raw, and unsalted peanuts. They are the only version that is safe for dogs to eat. Now, your dog will be just fine if he scoops a salted peanut or two from the floor. But don’t let that become a habit. Salted peanuts contain sodium, and your dog cannot process all that sodium. Too much sodium is harmful to the health of your dog. Avoid feeding salted peanuts to dogs. This is also the reason why some owners prefer to make their own peanut butter. Generally speaking, commercial peanut butter is safe, but you can never be sure whether it was made with salted or unsalted peanuts. Homemade peanut butter will give you control over the amount of sodium and oil you will use. How many peanuts can your dog eat? Moderation is the key here. And that applies to almost every human food. Peanuts contain high levels of fat, and that can cause digestive issues for your dog. Limit your dog’s intake to just a few peanuts, and to not give him peanuts every day. Flavored peanuts, for example, honey-roasted, are unsafe for your dog. Remove the peanut shell always to prevent any fibrous material entering your dog’s digestive system. Why are peanuts good for your dog? With all this talk about can dogs eat peanuts, we forget the important part. And that is, why should you give your dog peanuts every now and then. Peanuts are very nutrient dense, packed with vitamins, minerals, and other essential nutrients. They contain niacin, vitamin E, vitamin B6, protein, and healthy fats. All of these are nutrients your dog needs. That being said, as long as the peanuts are dry roasted, raw, and free of salt, they are safe. Why are peanuts bad for your dog? As with every human food you give to your dog, it is a double-edged sword. Yes, peanuts are a healthy treat. But there are ways in which peanuts can be dangerous for your dog. For starters, the shells are difficult to digest and can cause intestinal blockage. In some cases, especially with small dogs, the shells can be a choking hazard. The nuts, as well, can be hard to chew for some dogs. If swallowed whole, nuts can cause a gastrointestinal obstruction. Peanuts are high in fat. And while most of that is healthy fats, too much fat can cause an upset stomach in your dog. Over a long period of time, consuming too many fats can cause pancreatitis. Salted peanuts are the worst, and as mentioned previously, they are not safe for your dog. Flavored peanuts contain artificial chemicals, while salted peanuts are high in sodium. Peanuts are also considered a common allergen, and that applies to dogs as well. Some dogs might have an allergy and manifest allergy symptoms when consuming peanuts. These symptoms can range from mild to severe. If you notice any signs of allergic reaction, take your pet to the vet immediately. Should you feed your dog with peanuts? Before giving your dog any peanuts, it is best that you consult your veterinarian. That applies to any human food. They can advise you whether your individual dog is safe when consuming human food and how much of it they can eat. Because peanuts can sometimes cause gastrointestinal blockage, it is nice to find a way to prevent it. One way to do it is to ground the peanuts, or serve them as peanut butter. If you buy commercial peanut butter, take a look at the label. If there is xylitol, avoid it, as the artificial sweetener is toxic for your dog. The best way to use peanuts is as a reward for doing tricks or put them in a puzzle feeder. This will provide your puppy with some extra mental stimulation. Another way to use peanuts is to spread peanut butter on a Kong toy and freeze it for a refreshing treat. It will keep your dog busy for a while. With that in mind, if you have any interesting peanut recipes for dogs, do share them in the comments section.